What’s in Your Cleaning Solution? Humans are… well, pretty darn dirty. Not only are we dirty (did you know that 70-80% of household dust is dead skin cells? ), but the environments we live in are also prone to attracting dirt. At home and at work, dust, dirt, grime, grease, and other contaminants are widespread. The same is true for our phones, by the way. As one of Alberta’s up and coming commercial cleaning companies, we invest heavily into our cleaning processes and products. Today, we thought we’d talk a bit about how cleaning products/solutions work, what to look for, and why we use what we do. The most prominent ingredient in any cleaning solution is water. How a cleaning agent transforms water into a cleaning solution is a powerful example of everyday chemistry. Ready to learn a bit about cleaning science? If you’ve ever tried to clean a stain or a spill with water, you know first-hand how ho-hum the outcome can be. Water on its own is more attracted to itself than it is external compounds. This internal attraction – a result of the hydrogen bonds water is made of – is why water will remain in a glass, even when slightly overfilled. This surface tension keeps water together; water molecules prefer to hang out with other water molecules. A surfactant, when added to water, changes the cleaning game entirely. Suddenly water goes from being a mediocre cleaner to a powerful tool used the world over. 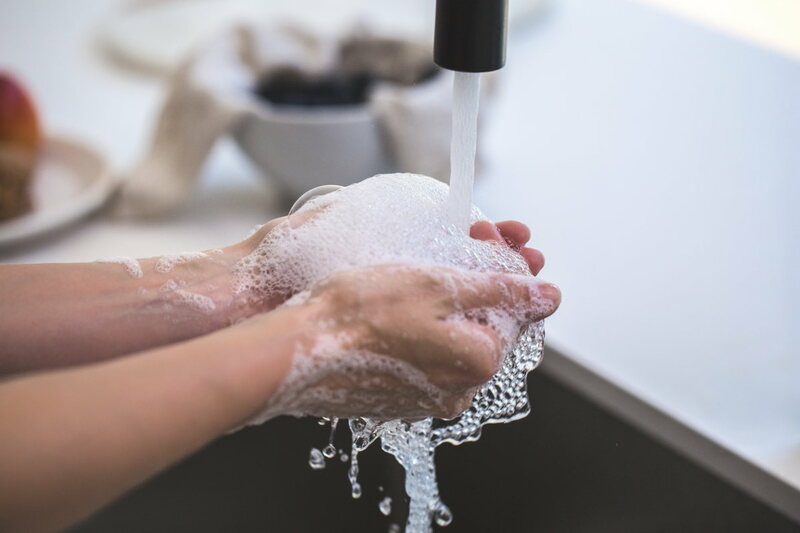 Surfactants range in both ability and strength, but they are present in every cleaning solution you use, from your hand soap down to your stain removers. Surfactants break the hydrogen bonds that bind water molecules together, allowing the new solution to flow freely and attract dirt. They change the physical properties of water and transform ordinary water into powerful cleaning tools. Ammonia – An effective glass, porcelain, and stainless steel cleaner. It is known for its streak-free qualities. Hydrogen peroxide – Very similar to water – it’s chemical compound is H202 – that breaks down into water and oxygen. An effective bleach, general purpose cleaner, and sanitizer. Sodium hypochlorite – AKA, powdered bleach. Soap – A fatty acid compound that is very effective in cleaning applications. It’s also used for lubrication in industrial settings. Sodium hydroxide – AKA, lye. A caustic substance that dissolves substances, such as limescale or grease. Lye is one of the first cleaning agents we know of, with history going back as far as the Roman Empire. There are many more than the above, but chances are the above are what is the most present in your home or office. The reality of our ever-changing climate is something that we at Picture Perfect Cleaning are very aware of. We believe that the future of our business is in sustainability, where we minimize our environmental impact as much as possible. If you’re interested, you can read more about our “green cleaning” ethos. Many cleaning solutions are harmful to the environment, especially our lakes and rivers. As effective as a powerful cleaning agent or surfactant is for cleaning, it can also have long-lasting negative impacts on the environment when they are disposed of improperly. The good news is that most people and businesses do not need heavy-hitting cleaning agents to get a heavy-hitting clean. For most situations, the right soap or hydrogen peroxide solution will do the job. Less toxic cleaners are also better for people that suffer from allergies or are sensitive to environmental and airborne irritants. Read more about why. Stone (granite or quartz) – A warm water/soap solution is generally sufficient. If needed, a mild bleach solution (ammonia or hydrogen peroxide) can kick it up a notch. Do not use abrasive cleaning products or solutions, as it was damage the finish of the countertop. Laminate – Same as for stone countertops, but be mindful when using bleach as it may alter the colour. Test somewhere inconspicuous first. Ceramic tile – A mild soap solution will do the job here, but be sure to change the water regularly to avoid the post-clean “haze” that ceramic is known for. Use a rag or chamois mop instead of a sponge mop (unless you love dirty solution filling your grout lines). A gentle peroxide solution can kick it up a notch for tough stains. Marble and other natural stone – Soap and water is the way to go here! Avoid using an acidic-based cleaner as it may alter the properties of the stone. Another notch in the “soap and water solutions” belt. In most cases, a soapy water solution more than sufficient to remove fresh stains (even coffee and red wine) if applied quickly. When dealing with carpets, speed really is key. Learn more about carpet stains (and what to do about them). Hot water and elbow grease – More effective than you think! Use a bit of hot water on a microfibre towel. Move in smooth lines and keep even pressure on the towel. Use a second dry towel to remove streaks. Ammonia – An ammonia-based solution is great for a quick streak-free shine, but frankly, the hot water/elbow grease solution is just as effective (and much less expensive). A general purpose peroxide based cleaner will do the trick here. Abrasive cleaning products, such as certain “eraser” type products, are effective as well but may damage the finish/paint. Test somewhere hidden before going to town on your walls. We are big fans of simple and environmentally friendly, so when we began researching and testing different cleaning solutions, we focused on those two areas. It biodegrades into water and oxygen (learn more about why that matters), minimizing any negative impact on the environment. It is non-toxic and very unlikely to irritate allergy sufferers. It’s suitable for most surfaces, including walls and windows. It’s versatility allows us to have a singular product that we know, use, and trust. It’s also Green Seal certified and wool safe, further reducing its impact on the environment or the people in it. Thanks for spending some time with us today learning about what’s in your cleaner! If you’re looking for a great commercial cleaner, give us a call- we’d love to hear from you: Calgary, Edmonton.